RoboDK supports all Fanuc robot controllers since RJ2, including RJ3, R-30iA and R-30iB. This documentation is based on the R-30iA Fanuc controller. The following sections demonstrate typical operations using a Fanuc robot teach pendant to prepare a new program in RoboDK and transfer it to the robot. Note: It is recommended to request the ASCII Upload option on the Fanuc robot controller to easily transfer offline programs without any issues, as explained in the section comparing LS and TP programs. Important: The ASCII Upload option is required for offline programming. This allows loading LS files directly to the controller. Alternatively, LS programs (ASCII files) can be compiled to TP programs (binary files) from the PC using Fanuc’s WinOLPC tools (MakeTP). 5. Select RESET. All alarms should disappear. 2. 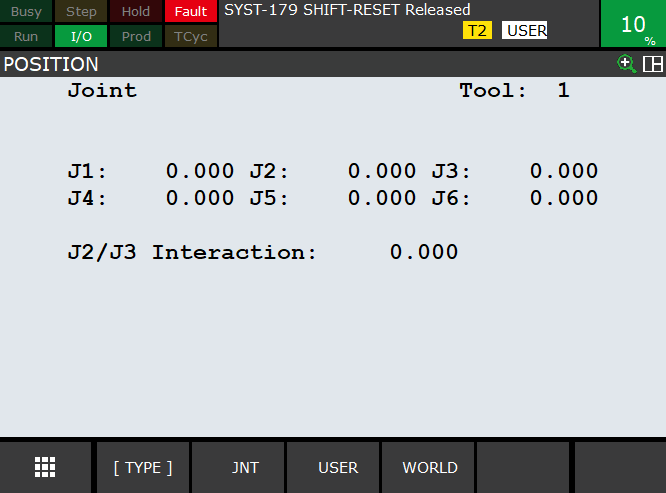 Select JNT on the screen or select COORD (button in the teach pendant) to select the joins mode. 2. 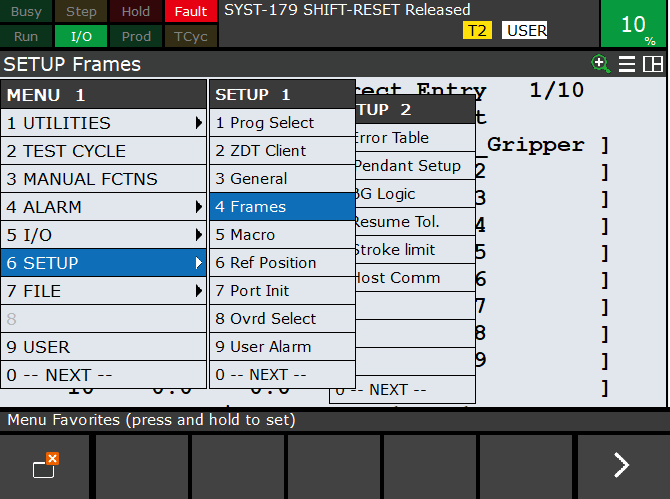 Select a tool using the arrows or the touch screen and select ENTER. 3. Modify the X,Y,Z,W,P,R values as required. 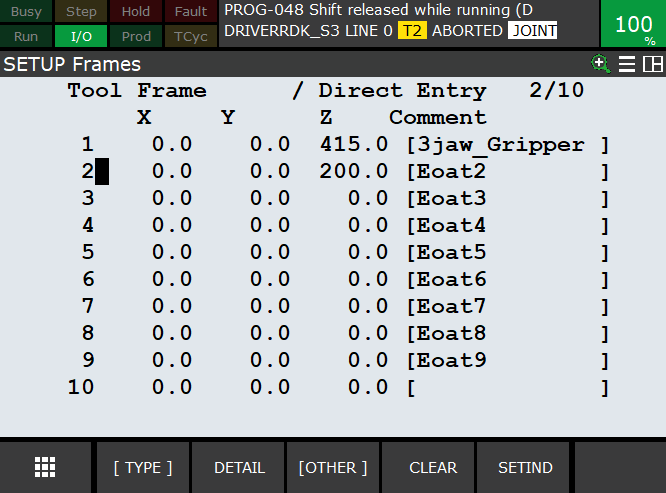 Note: A program generated from RoboDK may set up the tool on the robot controller as you defined it in your RoboDK simulation. This behavior depends on what post processor you use and how you generate programs in RoboDK. 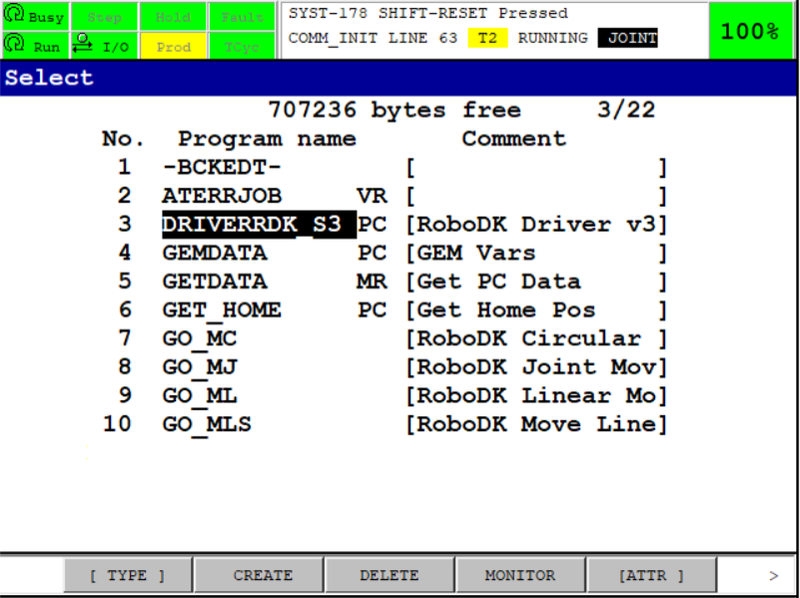 A connection between RoboDK and the Fanuc robot can be established to move the robot automatically from a connected PC using RoboDK. This allows using the RoboDK Run on robot option for online programming and debugging. The connection can be established through a standard Ethernet connection (TCP/IP). Important: This mode of operation requires the Fanuc software option User Socket Messaging and PC Interface. This is the main program that manages the communication through S3 (socket communication port number 3 – S3). Make sure to select the correct version (latest Fanuc robot controllers require using the version under the V9 folder). b. 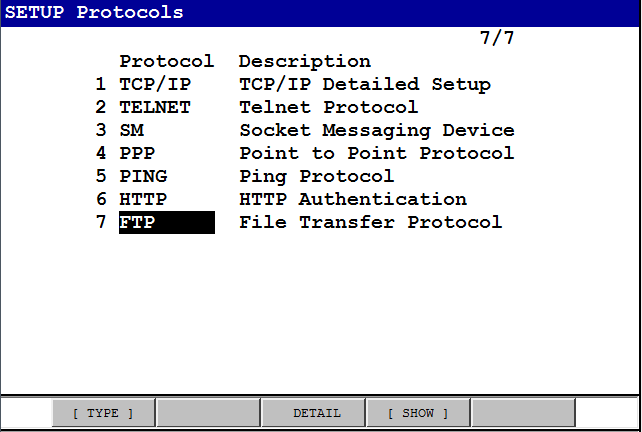 In Port Name, if multiple ports are available: Set Port to P3 (or the corresponding port). a. Select the Select button from the teach pendant. You should see the RUNNING message on the teach pendant. If the program failed to run it is likely that you don’t have a robot option (PC Interface or User Socket Messaging) or you did not take the correct version of the PC program. 7. In RoboDK, provide the IP of the robot and select Connect to connect to the robot. Note: If the communication fails or the robot enters in error mode you should restart the program DRIVERRDK_S3 and reconnect from RoboDK. 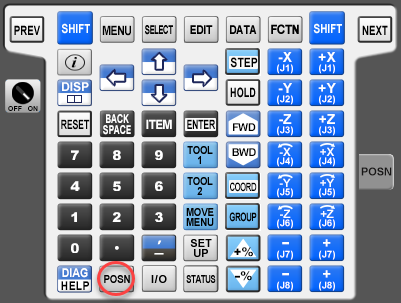 Note: The port 2000 is used as default for both RoboDK and Fanuc. 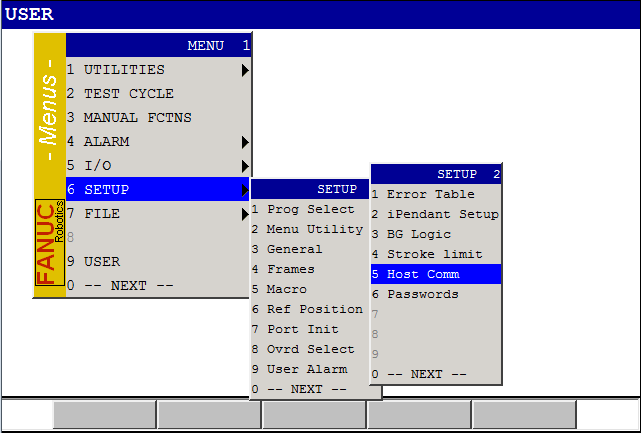 The port in section 1.c can be different but the same port needs to be specified in RoboDK (“Robot port” section of the robot connection menu). Important: If the program does not show as running it means that a controller option is missing. In this case you must contact Fanuc to activate the User Socket Messaging option. 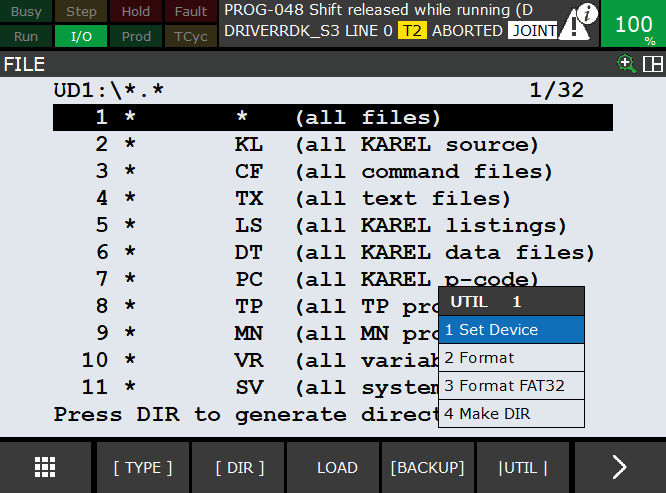 Note: The program DRIVERRDK_S3 must be selected and running for the robot communication to work properly. If the S3 register can’t be used for the robot driver you can load another PC file (such as DriverRDK_S4) that uses another S register. 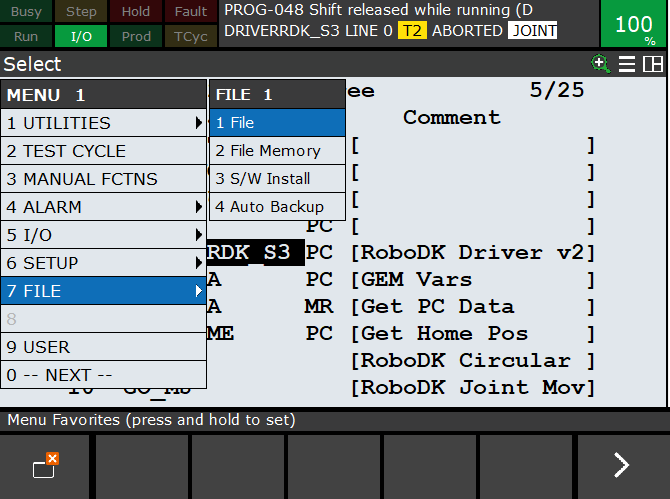 This section explains the difference between Fanuc LS and TP program files and how to automatically compile programs for Fanuc robots using RoboDK. 1. Have the ASCII Upload software option on the robot. This option might be available on the robot already. The best way to check if this option is available is to provide an LS file to the robot and it should be automatically converted to a TP file. For example, place the file on the FR disk and select LOAD on the teach pendant. 2. Compile the program using the WinOLPC tools from Roboguide. In this case, the same computer where RoboDK is installed can compile the LS program automatically using the “maketp.exe” compiler tool from Fanuc. This command requires a « robot.ini » file. This file can be generated with the setrobot.exe utility from WinOLPC if Roboguide was installed and a work station was saved on the computer (“Work Cell”). With RoboDK it is possible to obtain TP programs automatically right after an LS program is generated. RoboDK manages the WinOLPC tools automatically to be able to compile LS ASCII programs into TP binary programs. 1. The following screen appears by default after generating an LS program. 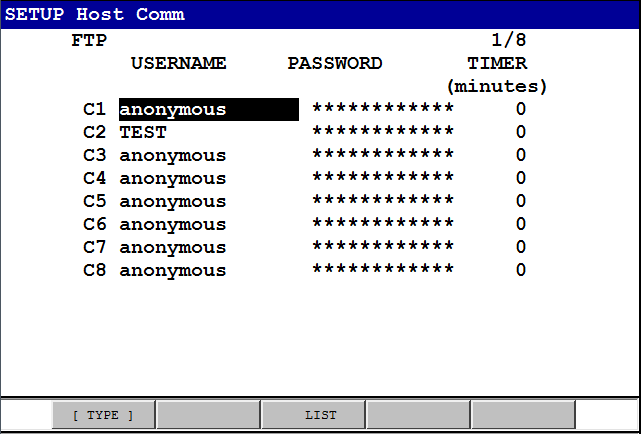 It is possible to select the robot from a Roboguide “Work Cell” or just not to compile the program. If “No” is selected, the last “robot.ini” file will be used. If the “robot.ini” file does not exist, RoboDK will automatically run “setrobot.exe” to generate the “robot.ini” file. 2. The executable maketp.exe is used to generate the TP program. 3. If the TP file or the robot.ini file can’t be generated, a Robot not set message such as the following will appear. If this message is displayed it is likely that the read/write access is limited for the default WinOLPC folder. It could also be that Roboguide has not properly been installed or that a “Work Cell” was never generated in Roboguide. Tip: More information available in the Post Processors section. As shown in the following image. This allows generating the robot.ini file in the same folder where the executable maketp.exe remains. This file is required to compile the programs. It is also important to save the Roboguide Work Cell on a folder readable by all users that must compile programs. Note: It is preferable to respect the compilator version but not mandatory. 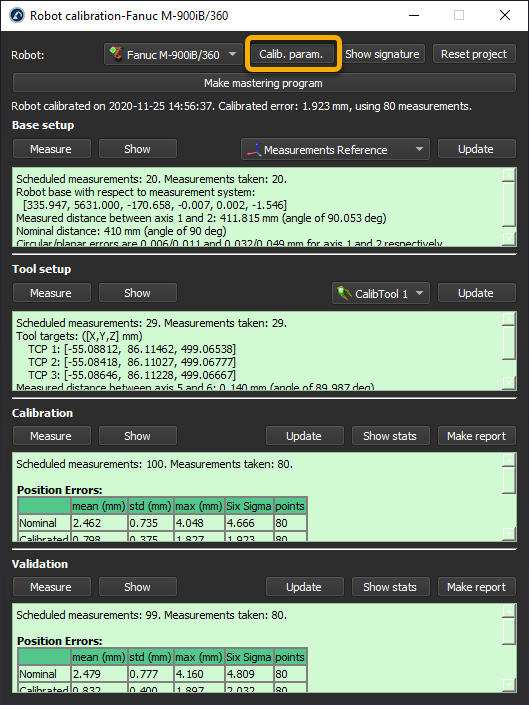 The compilation should work if the virtual WorkCell robot and the real robot have the same number of axes and same configuration in terms of options. Once you have a robot.ini file it is possible to use maketp.exe without the need of using setrobot.exe every time you change your robot. 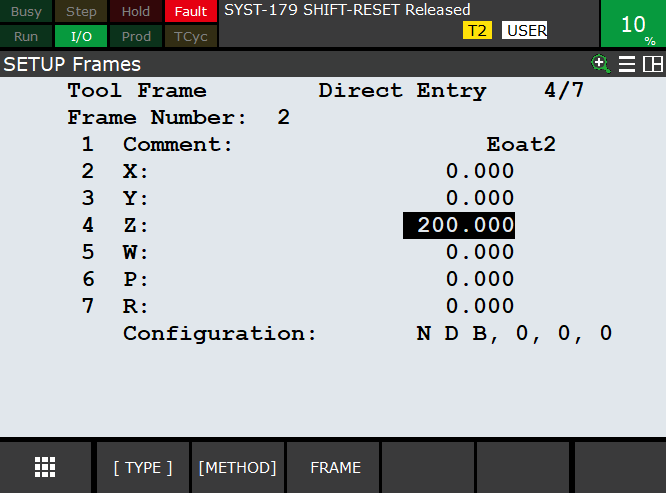 It is possible to define in this window what registers will be used by the default post processor to generate Fanuc robot programs. Alternatively, custom post processors can be used to better customize all these operations. 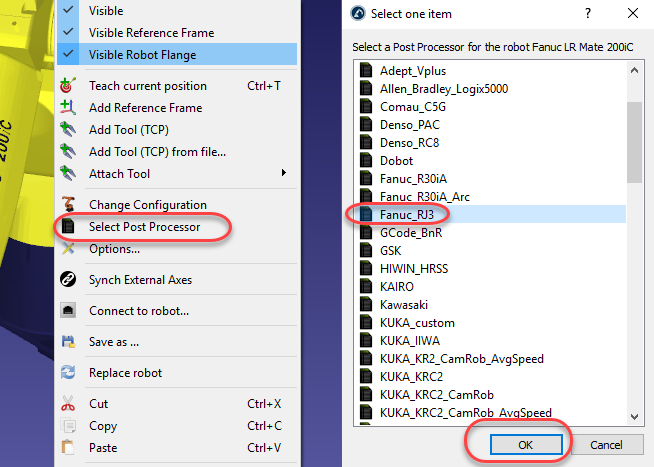 Two custom post processor are provided with the default RoboDK package for Fanuc robots (called Fanuc_R30iA and Fanuc_RJ3). RoboDK post processors for Fanuc robots support using 6 axis robots synchronized with external axes such as turntables or linear rails. Note: More information about customizing post processors is available in the Post Processors section.